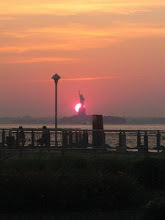 Local resident, Amy Haimerl, sends out a (mostly) weekly email titled “General Red Hook News and Ephemera”. I’ve copied the most recent mailing below, but if you would like to receive this comprehensive update of Red Hook news and information, she told me you can email her at amy.haimerl(at)gmail.com and she’ll put you on her list - whether you’re naughty or nice. 1. In the spirit of the holidays, I want to draw your attention to two groups organizing pet-food drives. Second, the Jewish Association for Services for the Aged is hosting a food drive through Dec. 31. This helps the elderly keep their pets in their homes and cared for. Plus, the organization needs for volunteers to help walk dogs (or clean cat boxes if you’re more inclined toward felines). 2. We are going to be losing one of our members: Richie Nelson, who owns Achilles, is leaving us for New Jersey. Though we will be sad to lose him and his family, congratulations are in order. They recently closed on a home. 3. Save the date: On January 20, Red Hook Dog will host our quarterly membership meeting/public dialogue on park issues. Representatives from Parks as well as officers from the 76 and parks police will be on hand to answer questions. Starts at 7:30 p.m. in the Park House. 4. How do you plan to dispose of your Christmas tree? Set it out on the curb or bring it to Coffey Park on the morning of Jan. 9 for Mulchfest! Red Hook Dog volunteers will be scouring the neighborhood for trees, dragging them to Coffey Park and then driving them to a chipping station to be turned into mulch for the Parks Department. We will need volunteers on the day of the event (super fun!) and also people to help post fliers in the neighborhood. If you’re interested, email me back. 1. 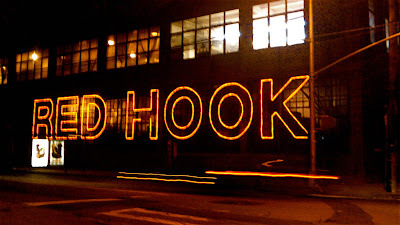 The blog Brokelyn says the Red Hook Community Justice Center needs present wrappers this Sat. You know you’re good with tape. 2. 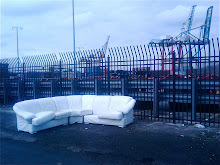 The blog TravelEatDrink featured Red Hook is week. They have the old standbys, but it’s worth checking out to see where the Good Fork’s owners like to eat and drink in their off hours. 3. The horror flick “Red Hook” is now available on Time Warner On Demand. I can’t give you a review, though, because I’m a big scaredy cat. Anyone else seen it? 4. Ever wondered about the crazy-looking sea shack across from Fairway? It’s the Red Hook Yacht Club. Answers here. 1. Wine from the Red Hook Winery is finally available. Yay! But at $45 a bottle. Boo! The new Brooklyn Wine Exchange at Atlantic and Court is carrying the vintages, if you want to try them. And the owners are “among the best winemakers in America” whose other labels can go for $200 a bottle. 3. The blog Gastrochic discovered Red Hook Beef Jerky, which is quite amazing. And it’s run by a couple in the neighborhood who also have a lovely Rottie. You can find the snacks at Ice House. 1. SATURDAY: “Kids Picks” at Kentler International Drawing Space. Reception from 10 a.m. to 11:30 a.m. Kids Picks is curated by local 5th graders from the Brooklyn New School, who chose selections from the Kentler Flatfiles to produce this show. 3. SUNDAY: Ditto the sample sale. But from Noon to 5. 5. FUTURE: Monthly Sunday at Sunny’s literary readings. January 3 at 3 p.m.
6. FUTURE: Monthly meeting with the 76th Precinct. January 5 at 7 p.m.
7. FUTURE: NYC MulchFest 2010: Jan. 9 and 10! What to do with your X-mas tree? Bring to Coffey Park and other parks to be chipped into mulch. Thanks you for sharing such a interesting story..I enjoyed it very very much ! While reading it, I felt that I was also there at the time of events. You explained everything very beautifully. It sounds like you also enjoyed there.